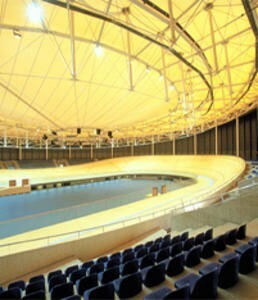 The upper membrane, a double-layered pneumatic PVC/PES membrane, covers the entire elliptical structure of 90m x 60m. 28 radial lying on the membrane, retain the membrane. The lower PVC/PES membrane is situated at the outside edge of the structure on a system of 56 flying masts and a cable net.